A simple test for checking if the jam prepared is ready to be packed and sealed. Take a spoonful of the jam, and place it over a small dish. Keep the dish in the freezer for 2 minutes. If it sets well you can ahead. If not, add more sugar, a little more citric acid crystals or lemon juice and pectin depending on the thinness and setting time. Boil for a minute, cool and test. Continue this process till you get satisfaction. By trial and error you can learn the exact quantities of ingredients. Before we proceed further let us discuss a few valid points about pectin, an important ingredient very much needed for jams and jellies to set them well. WE are aware that to thicken jams and jellies we need pectin which is present more in just ripening fruits than in ripened or too ripened ones. 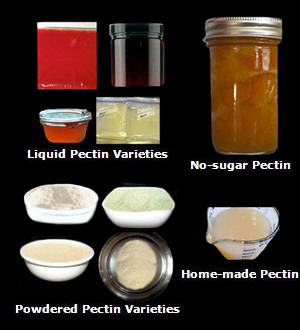 Pectin can be made at home and bought from market as well. Commercially two types are available – Sugar rich pectin and no sugar pectin. If you add sugar in the recipe and if the fruits are rich in pectin content, better go for no sugar pectin. If not, go for sugar rich variety. Similarly pectin is available in powdered form as well as liquid form. The quantity of pectin needed has to be determined by what is printed on the container/packet as well as by experience achieved through trial and error. Generally commercial pectin is made from unripe apples, crab apples and citrus peels. Pectin acts well in an acid environment with water. Sugar is very much needed for pectin to gel better and the texture as well as the consistency of jams and jellies improve when they cool and set due to sugar. You’ll need to follow the directions that come with the pectin, but generally, the lower sugar pectin recipes call for about 3.5 cups of sugar per box, and the regular pectin calls for 7 cups of sugar. Though the fruits have natural preservative, yet that will preserve for a shorter period only. Hence, we add citric acid and other chemical preservatives like (SB) Sodium Benzoate and Potassium Meta-bi-sulphite (KMS). The pectin content in all fruit is also generally higher when fruit is just barely ripe and diminishes as it matures from fully ripe to overripe. When the fruit starts ripening, it breaks down the pectin and in result, the fruit starts becoming soft and is generally not considered too fit for jams and jellies unless just ripening fruits are included. Even though we can buy pectin in the shops, it is better to have knowledge as to how it can be made at home. Take apple, crab apple, citrus peels, strawberries or blackberries which are not ripened but tart and just ripening. Wash these gently and cut into pieces. For each kilogram pieces take 1.25 litres of water. Boil the pieces in water and once the boiling starts, simmer the flame and cook for one hour. Put off flame. Place a clean cheese cloth, muslin cloth or diaper over a jar and keep these over so that the liquid drops drip in slowly into the jar. Keep the contents for overnight or till the dripping stops. You could stir them lightly to get a few more drops, but don’t press them. That will make the pectin cloudy. In case you think that the dripped liquid is too thin you can boil it for another 20 minutes, cool and then store in a bottle. Either you can have 1 kg of green apples with sour taste or small, green and unripe crab apples. Wash these without peeling. Take a vessel with thick bottom. Cut the apples and keep them in the vessel. Add 4 cups of water and 2 tbs of lemon juice. Boil till the contents are reduced to half the quantity (This may take about an hour). Put off the flame and strain through fine muslin or cheese cloth. Boil the extract for another 20 minutes. Let it cool and store in a sterilised bottle leaving at least one inch headroom below the lid for expansion, if any, and refrigerate. If there is a single clot of jelly the pectin is of the best quality. If 2 or 3 clots are formed, it is of medium quality. If more than 3 clots are formed, it is of low quality. In case of the last two qualities, you may have to boil the extract a few minutes more after simmering the flame. Caution: DO NOT TASTE THIS MIXTURE. IT IS HIGHLY POISONOUS. Whenever you make jams or jellies, first check if the fruits need any pectin or sugar as per the table already provided. If they are needed, then read the instruction on the packet/container of the commercial pectin as to how much sugar and pectin you need. If you use homemade pectin, then it depends upon its quality and thickness. For sugar, you need to use your prudence upon the sweetness of the fruits you use and the amount of sweetness you prefer. Liquid pectin, you need not dissolve it again but it is costlier as well as once the container is opened, you cannot store the excess unused quantity for future use. Dry, regular pectin, you need a lot of sugar to make jam or jellies. Dry, pectin with lower sugar formula, there is no problem in making good jams and jellies. It uses needs less sugar to thicken. Dry pectin with no sugar, makes firm jams and jellies but they will not be very bright and very thick. For this you need to add a little more sugar and/or fruit juice and boil for a few minutes under moderate flame. This entry was posted on March 14, 2012 at 8:20 am and is filed under Jams, Morabbas, Squashes and Sauces with tags citric acid crystals, essence, food colours, Jam, Jelly, mango jam, mango pulp, Morabba, pectin, potassium meta-bi-sulphite, sauce, sodium benzoate, squash, sugar. You can follow any responses to this entry through the RSS 2.0 feed. Both comments and pings are currently closed.